During the mid 1920s Picasso's representations of the female form began to take on a aoreaggressively distorted and contorted form. This might be partially explained by a change in the artist's personal circumstances. Certainly the first signs of tension in Picosso's marriage to Olga Khokhlova began to emerge at this time. However, consideration should also be given to other factors, not least of all Picasso's knowledge of the emerging Surrealist movement, with its emphasis on metamorphosis. Though embraced by the Surrealists, Picasso remained very much on the fringe of the movement, only occasionally exhibiting with them and maintaining on identity independent of the main group. However, the impact of Surrealism on his work is highly evident. 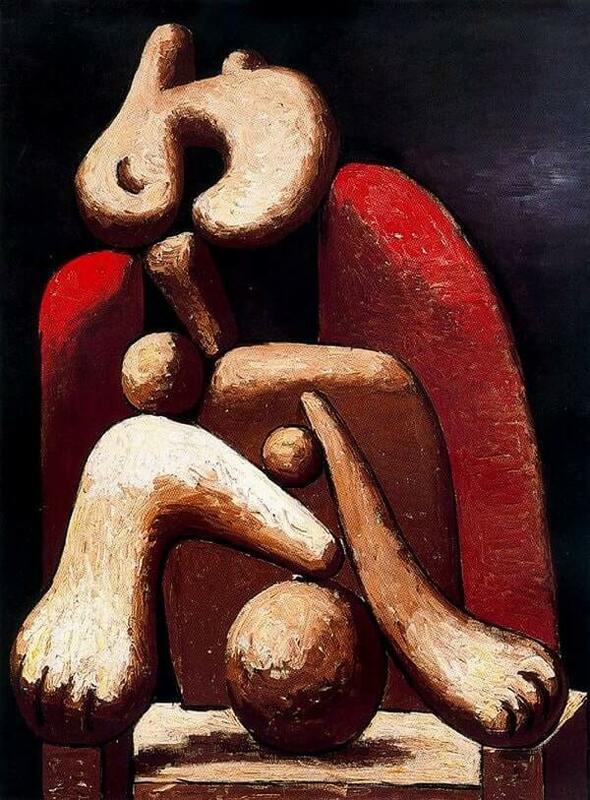 Woman in a Red Armchair reveals a significant shift in Picasso's work from his Neoclassicism. Monumental antique forms have here given way to abstract biomorphic forms reminiscent of Stone Age carvings. More importantly, these forms metamorphose to suggest the appearance a woman, constructed from various components, while two red obelisks in the background imply the armchair which this strange creature is seated.